When kids at our church start asking questions about what it means to follow Jesus, we invite them to a family experience called KidSplash. At KidSplash we walk kids and parents through the message of John 3:16 in a way that will make it easy for them to talk about salvation at home. One of the key exercises we give them to work on afterwards is called the Jesus Letter. When parents feel like their child is ready to be baptized, they sit down with them and have them write a letter to Jesus. They write the date at the top and then respond to the following prompts. Then the child writes out who Jesus is to them. This is where the child lists all the things they love about Jesus. I'm sorry for the times I . . . This is where the child expresses regret over personal sin. It doesn't need to be an exhaustive list, just their chance to tell Jesus what they want Him to forgive and change in them. Finally, kids have the opportunity to clearly articulate why they want to follow Jesus. Then they sign their name at the bottom. Once they're done, we encourage kids to read the letter out loud to their parents and talk about it together. 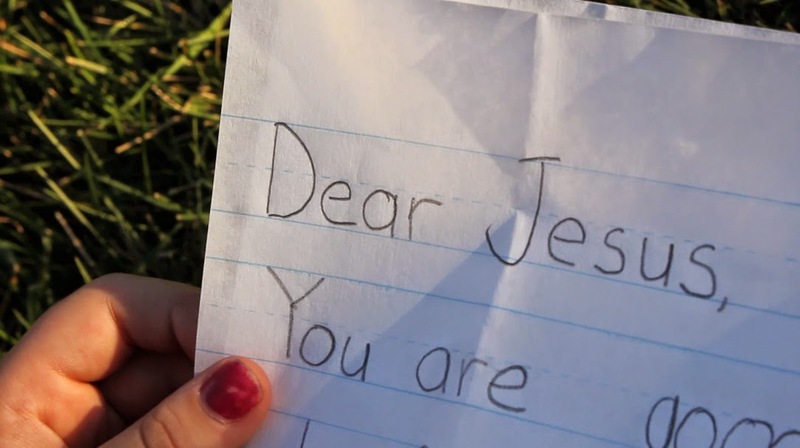 As a dad, I will never forget the day when my oldest daughter sat down, wrote her Jesus Letter and read it to me. I was crying tears of gratitude over this physical expression of how God was moving in my little girl's heart. What parent wouldn't love to have this treasure of faith? The Jesus Letter can become a powerful spiritual souvenir to remind kids of what God was doing in their lives when they became a Christian. Imagine when a kid hits a rough spot in their teens and starts doubting if they understood the choice they made as a child. How cool would it be for a parent to pull out the Jesus Letter and remind them of what God was doing in their heart? The Jesus Letter is also a powerful tool because it gives parents an x-ray into their child's heart and mind. It helps parents understand how their child is processing their decision to follow Jesus. Do they understand who Jesus is and what He's done for them? Do they express sorrow over personal sin and want to change? Can they spell out why they are making this decision? It's not that they have to have perfect answers for everything, but it does help parents see where they're at in their journey towards Jesus. But the Jesus Letter isn't just about coming to Jesus. It's also about walking with Jesus and remembering what He has done. We encourage our families to get out their Jesus Letters every year on the anniversary of their child's baptism to read together to celebrate their spiritual birthday. It can be a powerful moment to remember how God saved them and to look forward to what He is going to do in their life in the coming year. The best thing about the Jesus Letter is that it's easy enough that anyone can do it. Try it with your families and see what kind of amazing things God may do just because a child sat down and wrote a simple letter to Jesus. I love this idea! As author of Love Letters from God, it totally resonates with me!